Every world travel has a bucket list and if there's one common destination you're sure to find near the top it's Australia. Despite being remote and distant for North Americans it remains one of the most popular exotic travel destinations. 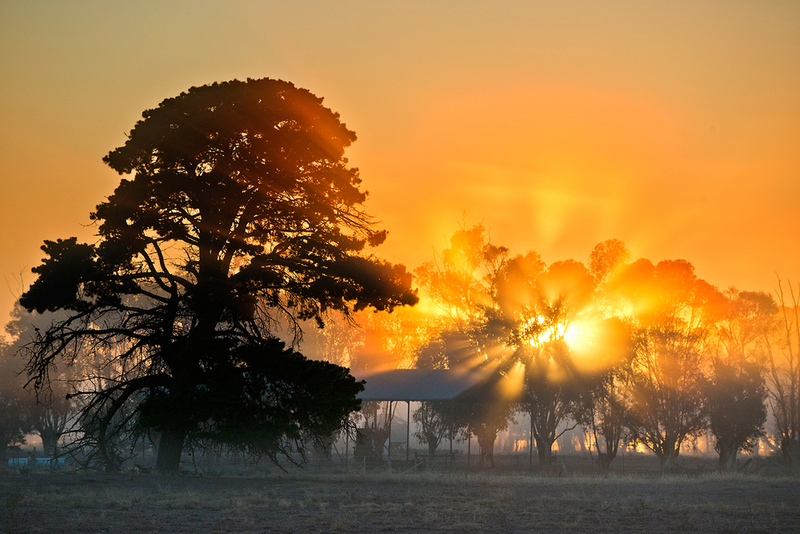 With bustling metropolitan cities often short distances from the rugged Outback, striking contrasts no doubt add to this majestic country's allure. With a similar size to the United States don't expect to see it all in one trip, but we've made sure that our itinerary spans a representative gamut, starting with big city life in Melbourne before exploring smaller Adelaide, the Barossa Valley wine country, picturesque Adelaide Hills and the unique adventure that is Kangaroo Island. Photozonetour leaders Layne Kennedy and Mark Alberhasky are joining forces with Rob Armatys, an Australian photographer anxious to share his passion for country and culture. Layne and Rob scouted the itinerary in 2015, laying the groundwork for a dynamic itinerary sure to engage and delight even jaded world travelers. Ranked as one of the world's most livable cities, Melbournians thrive on it's vibrant energy, sports, fabulous restaurants, café filled laneways, bars, fashion boutiques, art galleries and spacious parks. A young city with a pulse that never rests, Melbourne literally has something for everyone. Our stay will be in the Southbank/South Wharf area, a social hub on the Yarra River and walking distance to so many great places. Whether you want to just chill out and rebound from a long flight or let the city's energy carry you through the day Melbourne will hit the spot. Today we continue to explore Melbourne's attractions, including a proper overview. And by overview I mean a view-over-Melbourne, by helicopter! Purely optional, this can be a photographers dream platform with exciting perspectives that change by the second. The heli flight includes a fly by of the city skyline, through towering skyscrapers with a view of Melbourne's beautiful foreshore and iconic landmarks. After an exciting day we'll dine in one of Melbourne's most unique establishments, the Colonial Tramcar Restaurant. Historically restored tram cars cruise the city streets while diners enjoy seasonal menus and Australian wines. It will be a meal experience you're not likely to find anywhere else in the world, while enjoying the beauty of Melbourne under lights at night. After breakfast a short domestic flight will take us to Adelaide. A few notches down on the urban hectic scale, Adelaide allows the visitor to ease into the laid back lifestyle for which Australia is known. Our day will include a visit to Henley Beach, where the operative word is tranquil as we begin our transition from urban toward rural Australia. Just 20 minutes from Adelaide, we will travel up into the Adelaide Hills, visiting the town of Hahndorf, a locale which reflects the influence of migrants and settlers that came to Australia. Here you will experience quaint small town lifestyle that feels decades apart from urban Adelaide. Beautiful fall colors should paint the landscape and you'll have a chance to pick up some authentic Aussie treats and souvenirs. After a relaxed day we'll dine at Gaucho's, an Argentinian steakhouse where the fare is cooked to perfection and served with a fine selection of Australian wines. After breakfast this morning, depart from Adelaide and venture into the Barossa Valley. Enjoy a private tour of the Seppeltsfield Winery, an iconic landmark dating back to 1851. Seppeltsfield's is the only winery in the world to release a 100 year old single wine vintage every year. As part of the winery tour you'll explore hidden treats and learn of the Seppeltsfield history while sampling wine and food tastings. To ensure a representative sample of Down Under lifestyle, we'll dine for both lunch and dinner here, allowing ample time to photograph the winery, set among beautiful Australian Red Gums and rolling valley hills with endless vineyards. After breakfast in Adelaide we depart for an 8.4 mile ferry ride to Kangaroo Island, one of Australia's hidden gems. The land was originally populated by Aborigines who left as sea waters began to rise, separating the land from the mainland in creation of an island. Much later the island was repopulated by whalers, but now primarily hosts an agricultural lifestyle for island dwellers. Indigenous wildlife is protected in a number of nature preserves, where lack of predators ensures a paradise existence for kangaroos, koalas, echidnas, wallabies, seals, birds and a variety of other species. When we arrive on Kangaroo Island, we will first explore the western side of the island and visit locations such as Cape Willoughby Conservation Park, Dudley Peninsula and stunning coastal seascapes. As we make our way to our secluded accommodations we will pass American River, Pelican Lagoon and Pennington Bay. There will be lots of stops so you can appreciate the true essence of Kangaroo Island and ample opportunity for amazing photographs. Upon arrival at Waves & Wildlife Cottages you will likely be greeted by a few ‘locals’ (of the bouncing variety) curious to meet and eventually get to know you better. We will spend the rest of the day exploring new surroundings and later experience a True Blue ‘Aussie barbeque’ or ‘Barbie’ as Aussies like to call it. Without even trying you'll be learning local lingo and fit right in. The second day on Kangaroo Island will start with a hearty breakfast and most likely a warm good morning from our ‘Skippy’ friends. By this time, the bush telegraph has been working overtime and you can just about count on having inquisitive neighbors waiting to meet you. We will visit different places and locations around Kingscote and Emu Bay, like an Aussie billabong, some marine life (if they are not too busy) and various birds. We will also visit Island Beehive, providing a fascinating insight into the history of Ligurian bees and their complex lifecycle while watching keepers harvest the honey. Of course, no visit would be complete without some tasting. To finish of the day, we will enjoy an evening in Kingscote and experience country style cuisine in a small local town. Country folk love to pile on food and drink so bring a huge appetite and a thirst worth quenching from a day of adventure. This will also be a chance to show some true Australian hospitality by practicing your Aussie lingo – ‘pass the dead horse’ (translated it means ‘pass the ketchup’). After a big brekkie overlooking a beautiful cove we will head out to the North Coast and Heartland regions of Kangaroo Island. The northern coastline is simply stunning, with white sandy beaches, clear waters, hidden coves and spectacular coastal scenery. Turning back inland you will find the true heart of Kangaroo Island, Parndana. Parndana is home to the Kangaroo Island Wildlife Park, where we'll find one of Southern Australia's largest collections of rare and unusual birds and animals. How better to finish of a beautiful day of adventure than an Australian dinner under the sun set. Share the emerging stars with the pleasure and company of our furry friends. Truly Down Under at some of it's best! Following breakfast we say good bye to our wildlife friends and head down to the western and southern regions of Kangaroo Island. Western Kangaroo Island offers numerous walking and hiking trails that are well worth the effort, getting up close with Australian flora and fauna. We'll visit places like Weirs Cove, Rocky River and Sandy Creek Hikes, just to name a few. Our visit continues in Flinders Chase National Park, home to two of Kangaroo Island’s most popular landmarks – Admirals Arch and Remarkable Rocks. Here you can walk among giant granite boulders sculptured by nature, that balance dramatically on the cliff edge. Watch your step or take a plunge 250 feet into the turbulent Southern Ocean below. At Admirals Arch see where the powerful forces of nature have cut through the headland to create this natural geological formation. Here, you will view New Zealand Fur Seals resting, swimming and playing in the waves or on the rocks. 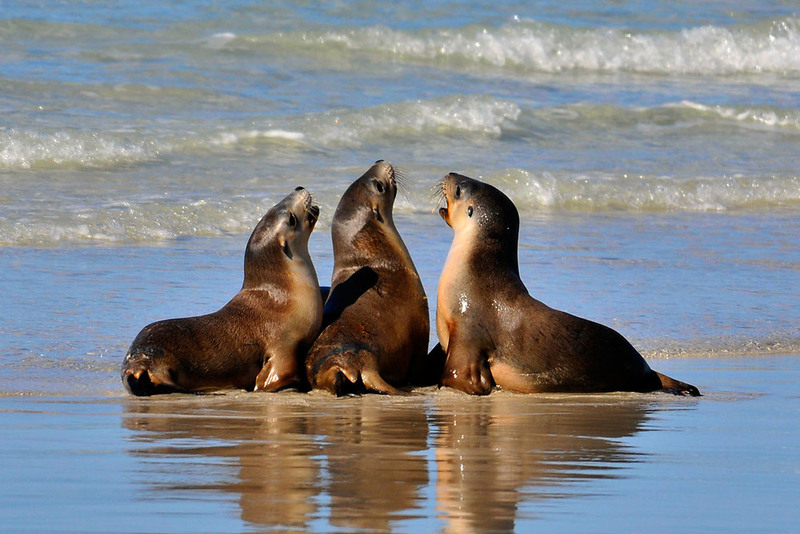 After visiting ‘The Remarkables’ as the locals call it, we will head along the Southern Coastline and visit a few of Kangaroo Island’s other hidden attractions including Seal Bay Conservation Park, Little Sahara and Vivonne Bay. At the spectacular Seal Bay Conservation Park, we will join local guides on a memorable walk along the beach. This bay is home to a healthy Australian Sea lion colony. You will be able to walk amongst the sea lions in their natural habitat as they bask on the beach or lounge in sand dunes, relaxing after an extensive fishing expedition. This is a truly unforgettable experience — one that you will treasure forever. Having sampled yet another day of Australia's unique contrasts we will check into a luxury resort to recharge our batteries and get pampered, with the spectacular Southern Ocean at your doorstep. Following a breakfast sure to be luxurious, we will say farewell to Kangaroo Island and make our way back to the mainland. A leisurely pace will allow us to explore the rugged southern coastline near the resort and re-visit areas of interest, in case the weather threw curve balls during our first time around. After returning to Adelaide, luxury awaits at The Grand, our hotel in Glenelg overlooking the ocean. There will be time on your own to explore the shops, try different cuisines, visit attractions like HMAS Buffalo (an old sailing ketch), take off your shoes and walk miles and miles of sandy beach or just soak up the relaxing environment. There is plenty to see and do. Before departing Adelaide, we will take our final dinner at Penfold's Winery / Magill Estate Restaurant, home of the renowned Penfold Grange Hermitage wine. Contemporary food, an extensive collection of Penfolds wines and stunning views of the city skyline complete your Australian experience. Today, bid farewell to Australia as we depart from Melbourne for the international flight back to the US. • PASSPORTS are required for all US citizens traveling abroad and must be valid for at least 6 months after your date of return. Many countries will not allow you to enter their borders if you do not have at least 6 months of remaining validity on your present passport. If you already have a valid passport, please send Photozonetours a PDF copy of the signature and photograph pages of your passport with your reservation. If you do not already have a passport, you should make arrangements to get one without delay and send the photocopies of the appropriate pages as soon as your passport arrives. Be sure to sign your new passport before you make your photocopy for us (well focused camera phone images of the passport pages will suffice). Photozonetours must receive your passport copy 60 days prior to departure in order to assure that your name appears on airline tickets exactly as it appears on your passport. Airlines may apply penalties if it is necessary to make corrections to your name either in the air record or on your ticket. • VISAS U.S. passport holders must have a visa to enter Australia, in addition to a passport valid for at least 6 months after dates of travel. Most participants on this tour should be eligible for the ETA (Electronic Travel Authority) visa, which can be obtained via the internet by providing passport information. The ETA visa is purchased by credit card for a nominal fee. If you overstay your ETA or any other visa, even for short periods, you may be subject to exclusion, detention, and removal by the Australian Department of Immigration and Border Protection. Click this link to apply for an ETA visa. • TRANSFERS & TOURING All transportation in Australia (for the group itinerary), including domestic flights, is provided by Photozonetours, in conjunction with local vendors. All entrance fees to places visited in the itinerary are included except those mentioned as optional. Arrangements for the itineraries, domestic transportation and flights are solely at the discretion of the local land operators and are subject to change without notice. If any changes are made, Photozonetours has no liability. A deposit of $1000 per person is required for each individual when placing reservations. If we are notified of a cancelation prior to February 1st, 2016 $500 of the deposit is refundable. FINAL PAYMENT is due February 1, 2016 or on the due date indicated on your invoice. Payments may be paid by check or major credit card for a small surcharge. If you must cancel your trip After March 1, 2016 we are unable to refund payments due to commitments to hotels, airlines, etc. If we are able to fill your spot with another client we will refund your payments in full. If we should cancel the trip, we will refund all fees paid, including deposit. However, to protect your travel plan investment we recommend purchasing travel insurance. Information on travel insurance is available on request.